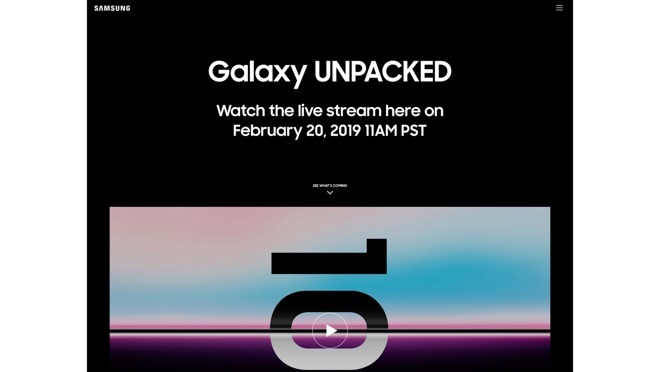 Samsung is expected to unveil its Galaxy S10 at a recently announced special media event set to take place on February 20th in San Francisco. Just a few days ago, a supposedly official Samsung press image was leaked by evLeaks, suggesting the upcoming Galaxy S10 lineup will feature three handsets, potentially of different sizes and capabilities. While relatively few items are known about Samsung's device before its release, details of the performance of its processor may already have been made public. The top-end Galaxy S10+ is rumored to be one of the first phones to employ the Qualcomm Snapdragon 855 processor. 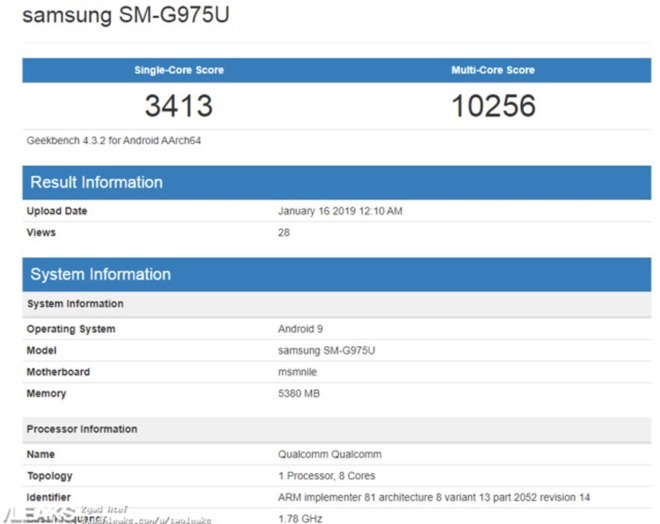 Benchmarks for the Snapdragon 855 have also leaked, specifically Geekbench 4 scores, with the S10+ apparently scoring 3,413 points in the single-core test and 10,256 in multi-core. 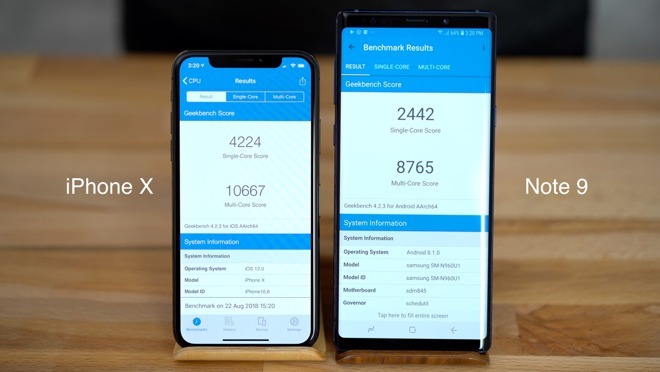 The iPhone X from 2017, powered by Apple's A11 Bionic processor, actually scored higher in both single and multi-core tests compared to the leaked Galaxy S10 benchmarks. The iPhone X achieved 4,224 points in single-core and 10,677 points in multi-core. That was the iPhone X, but what about the iPhone XS and iPhone XS Max? The iPhone XS scored incredibly well in everything from processor to graphics performance. In Geekbench 4, it churned out a single-core score of 4,803 as well 11,447 in multi-core, and it even managed a higher Antutu score than any other smartphone on the market with 364,287 points. However, Antutu itself recently tested a reference device packed with the Snapdragon 855. 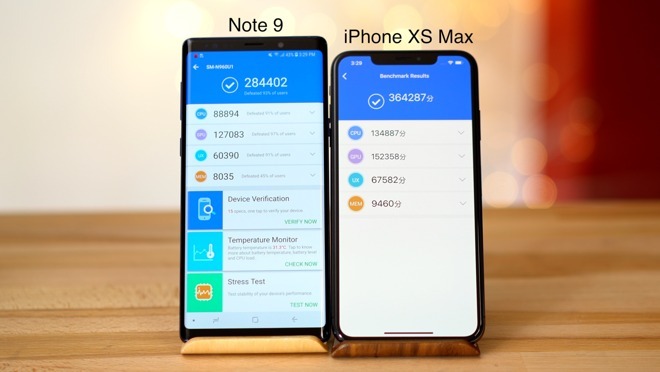 That device managed a score of 362,110 in Antutu's graphics benchmark, close to the one reported for the iPhone XS Max. 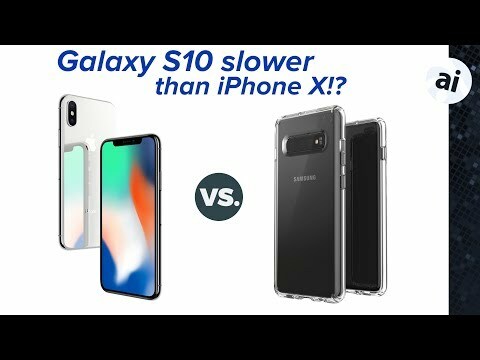 So if the Galaxy S10's processor is quite a bit slower than the A12 Bionic, what does that mean for the iPhone vs Samsung Galaxy flagship debate? Not much, really. Flagship smartphones these days are reaching such high levels of hardware performance that nearly all but the most demanding apps run as smoothly as possible. Almost everything you can do on a flagship smartphone runs perfectly fine for the vast majority of users. For example, even though the iPhone XS Max is significantly more powerful than the iPhone X, you can't really feel those differences in everyday use. 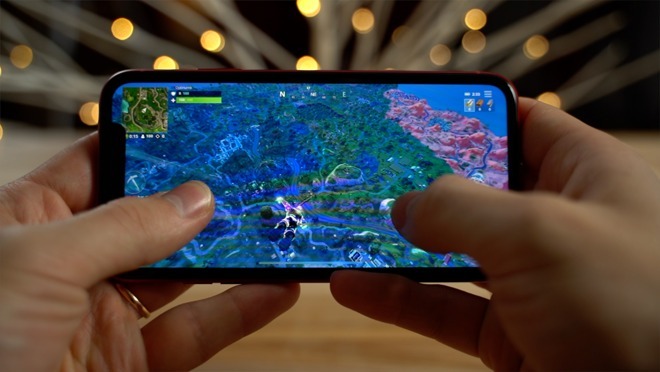 Recently, Epic Games released a patch allowing 2018 iPhones to run the wildly popular game Fortnite at 60 frames per second at high settings. This makes for a pretty amazing gaming experience that you simply can't get on older smartphones. When we last compared Apple and Samsung devices using Fortnite, it was the iPhone XR and the Note 9. While the XR's powerful A12 processor was able to run the game perfectly, the Note 9 struggled with some dropped frames, even at only 30 frames per second. These types of demanding apps or games are what we need to actually feel the extra power in the latest flagship phones. Unfortunately, there simply aren't that many apps that can use these phones to their full potential. For that reason, you likely won't see much of a difference between Samsung's Galaxy S10 and the iPhone XS Max in real world use. Sure, there's differences in physicality and the interface, among others. 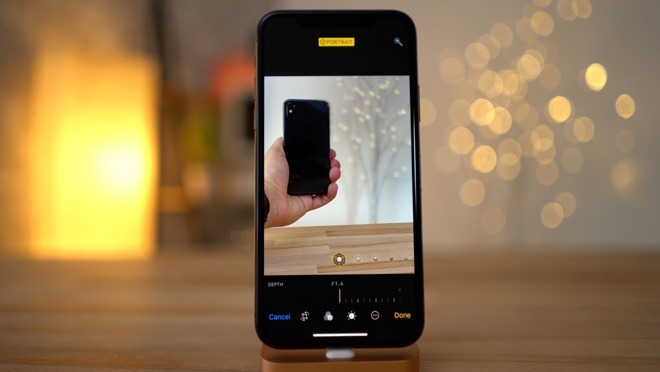 While there is likely going to be a big difference in performance in the iPhone's favor, the vast majority of the user base just won't perceive it without closely scrutinizing both devices. The purchasing choice you make really comes down to which operating system you enjoy using more given that prices appear to be very similar between the two. 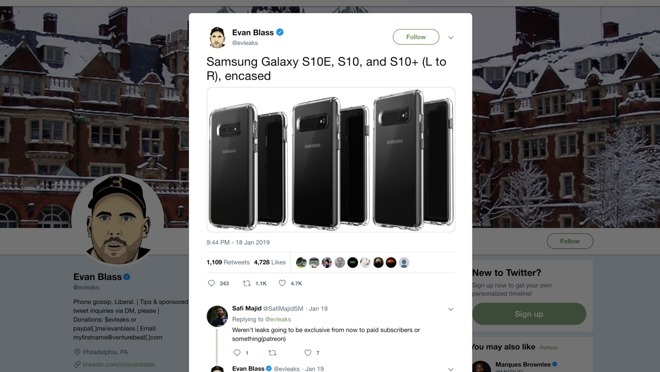 AppleInsider will be acquiring the Galaxy S10 shortly after launch to give it a thorough examination, and to pit it against the iPhone XS Max. Aren’t we at the point of smartphones being like toothpaste brands? Or car brands? Phone to phone “competitions” didn’t matter that much when the market was expanding 6 years ago. They matter even less today. Then, the quality of phone is but one aspect of sales success. Carrier relationships, services, retail availability, and even government relationships all matter just as much. Then the premise of customers cross-shopping between these phones is getting weaker and weaker every day. Today, OEMs are doing the utmost to even try to get people to upgrade from 3 year old phones let alone getting existing customers to switch. The battle is really to get people to upgrade. 2018 iPhone life cycles could be 4 to 5 years average. Decreased sales are inevitable for all OEMs. 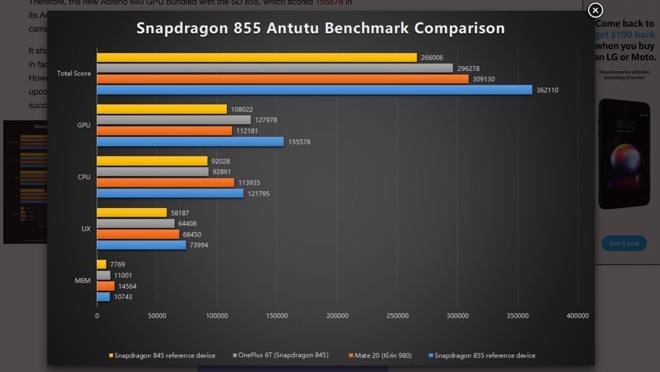 Just a reminder...ANTUTU benchmark canNOT be compared across OS. Android and iOS Antutu scores cannot be compared due to different algorithms used. Therefore, Antutu is a useless benchmark across different OS. Doesn’t matter what the S10 has for a processor (which will obviously be slower than the A12 anyway). It’s running an inferior OS, and will therefore always be inferior. It's an industry thing. We need to look past platform specifics and see what's happening on a wider level. People care when they are asked to pay high prices and certain features are missing but available on competing phones. In fact they even care when paying far less. Often you want the best deal possible for the price you pay, irrespective of platform. The S10 is the Samsung iPhone X (ten year phone) and is supposed to be a key release. We'll see what it brings to the table but competition (P30 Pro) is going to be fierce. MWC will bring a heap of announcements. So was the question of how the iPhones will fare against the S10 answered by this article? Android users care more about what Apple does than Apple users. lol - arguments like the ones in these comments often fail to account for the one thing that matters most - experience. Hardware isn't useful without software and vice versa. I've had several friends move to Android and almost all of them are back to iOS because they discovered things didn't always work the same as they were used to. I also have friends on Android who remain because they are vested in the Android universe. For the vast majority of people these devices are not technological marvels that are of interest in and of themselves. They are tools that either help them do what they want or they don't. AI, get ready to be labeled an "iSheeps" for speaking truth. I made a similar video months ago and got so many dislikes for being honest. LOL. Not that I care but curious what is S10E physical or screen size ? I know Samsung following Apple with 3 phones release ? You couldnt pay me to switch from the Apple ecosystem. Price of the device itself is not a concern for me. MWC will bring nothing new. It will all be minor incremental updates to existing technology that people will blow out of proportion as to their relevance. Then when the iPhone comes out with its incremental updates in the fall it will be criticized for lack of innovation. - We’ll get newer OLED screens in a few new sizes/resolutions, but none of them will be calibrated for color accuracy so they’re all pointless. - We’ll get newer slightly faster (but still inferior to Apple) processors which will mean nothing because Android Apps are a joke and none of them can utilize those processors anyway. - We’ll get a bunch of new tablets with 1-2 year old processors that still won’t be able to compete with the iPad along with the same unoptimized phone Apps blown up to fit. - We’ll get new Chromebooks that most Android Apps still won’t work properly on and still limited by the lack of serious Apps for Chrome. - We’ll get Windows on ARM laptops that are still slow and are still limited as to what types of Apps they can run. Performance wise, you are correct. But, there is a huge difference between Android OS and Apple iOS. Google (Andriod) has still not figured out getting OS updates and security fixes to users in a timely matter. Google is trying to force manufacturers to be responsible, for example they created “Andriod Enterprise Recommenced”. Basically the OEM (I.e. Samsung) is committed to providing OS updates for 2 years, and security patches with 90 days. Those requirements are terrible when compared to iOS devices. If I was considering an Android device it running “Android One” is a must. It still guarantees 2 years of updates but gets then to you faster; because it runs unmodified Android. But more importantly it gets the security updates in less than a month. I didn’t look to hard (still happy with my iPhone 6s) but it looks like not Samsung runs Android One. 'Nothing new' doesn't sit well with the above rumours. Throw in Samsung announcements, IoT developments and all the 5G progress and things look quite interesting. Nope, nothing new. How can something be “new” when you’re able to link to article with details? I don’t think you understand what “new” really means. 5G? Yawn. Let me know when it will be usable by more than a fraction of the population. And whose networks are they going to access with their modem since Huawei is having a hard time getting companies/countries to install their spy gear? MWC is going to be a big bore with lots of promises but few realized. The links are to - rumours - except for the Balong5000 presentation which is from today and was the - MWC2019 pre-briefing. It's all part of official the MWC build up and is just the core technology of some aspects. No one has any idea about how that will be used. For that we have to wait for the fair itself. Balong5000 is far from yawn worthy. Out of the gate it is making the X50 look quite limited in its scope. A complete, ready to market, power efficient, low latency, multimode, V2X ready, Kirin980 compatible solution. They have already signed 30 carrier deals and shipped thousands of new 5G base stations. Obviously China will see most of the tent pole features first but somewhere along the line users of the supposed 5G S10 variant will reap the benefits, as competing 5G backbone solutions are said to be around a year behind what Huawei is actually shipping today. Huawei 5G...irrelevant. I lost count now how many countries are on the list to ban Huawei stuff. Almost everyday, a new Western country considering banning Huawei crap. You lost count after how many? Huawei has already signed 30 carrier deals and is shipping thousands of 5G base stations. That is hardly irrelevant. As for being crap, can you name anyone in the 5G industry that has better products? It's not me who says competitors are behind, it is carriers and industry watchers. Politics more than technology, no?